Buakaw Banchamek is set for his next fight. 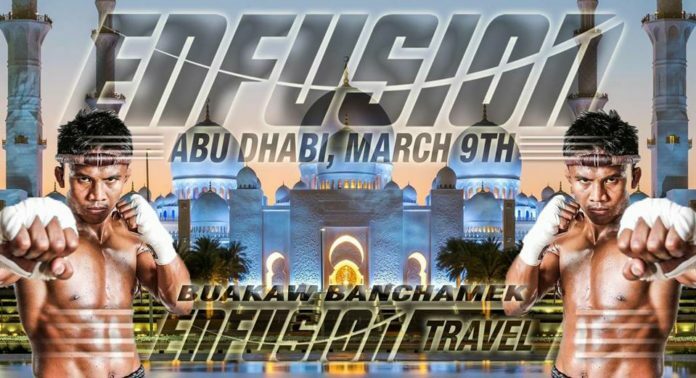 This time Muay Thai celebrity travels to the United Arab Emirates where he battles out in the main event of Enfusion Kickboxing promotion. The event takes place at du Forum on Friday March 9. Buakaw’s opponent is the current 70 kg title-holder Jonay Risco, who faces renowned Thai in defense of the belt. Jonay Risco is the Spanish kickboxer, who over the course of his career defeated Mohammed Jaraya, Dzianis Zuev, Christophe Pruvost, among others. Arguably the most notable win in his resume to date features the 2015 extra round decision against K-1 World MAX 2005 Champion Andy Souwer. Buakaw is riding the seven-fight win streak. In his most recent bout at Kunlun Fight 69 he knocked out Congolese Nayanesh Ayman in the first round. Buakaw has gone the five-round distance since 2014 when he scored a unanimous decision against French Djime Coulibaly in Monte Carlo, winning World Muay Thai Council junior middleweight title. The schedule of the upcoming championship bout against Jonay Risco is also expected to be five rounds. yeah, clearly rigged match once again. watch the replay again. Buakaw is the real winner of this 5 round match.